Filters are short statements that you can apply to a Google Analytics widget to refine the data that’s displayed and drill down to particular metric you're interested in. Where available, filters can be applied from within your widget’s setup screen by adding a Custom filter statement to the Filter by field. While our Google Analytics Number and Leaderboard widgets also offer pre-built filters, you may find this article useful for understanding filters in general and how to use them. What is a filter statement? Let’s say you are interested in building a Number widget that displays the number of visitors this month to the contact page on your website. By default, the widget will pull through the total number of visitors across the whole of the website you’re tracking with Google Analytics. However, applying the filter ga:pageTitle==Contact would allow you to refine this and display only the visitors to your page titled Contact. Google Analytics offers two categories of data - Core Reporting metrics and Real-Time Reporting metrics. The filter statements you write will differ slightly depending on the widgets you use. Core Reporting filter statements always begin with ga: and use the dimensions and metrics available through the Core Reporting API . Where ga:source is the dimension or metric you want to filter on, the operator is how you want the field to be compared (equals ==, not equals !=, contains =@, etc. ), and twitter is the string or value of the comparison. Google Analytics' Real Time Reporting API  lets you track data and events occurring currently on your website (e.g. number of visitors currently on your website, number of people currently performing a particular Event Action on your pricing page, etc). In Geckoboard, Google Analytics widgets and metrics with the words Current or real-time in their title or description use this API and let you track real-time data. Widgets with the word Current in their title also refresh at a faster rate than others, as they serve only real-time metrics. Real-Time Reporting filters always begin with rt: and use the dimensions and metrics available through the Real-Time Reporting API . Where rt:source is the dimension or metric you want to filter on, the operator is how you want the field to be compared (equals ==, not equals !=, contains =@, etc. 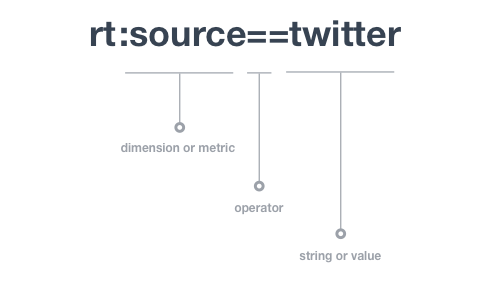 ), and twitter is the string or value of the comparison. The cornerstone of the filter statement are the dimension(s) or metric(s) that the widget is supposed to filter, such as the source of traffic or the URL of a specific page. Almost the full range of dimensions and metrics  can be added and even combined within a filter statement to create a very specific set of data within a widget. Google Analytics doesn't allow for certain combinations of dimensions and metrics to be queried together. For example, AdWords related metrics Cost, Cost per Conversion, Cost per Goal Conversion, Cost per Transaction) and Event Tracking dimension-based filters (Event Action, Event Category, Event Label) cannot be used together. Operators work with dimensions and metrics to allow you to specify how your data should be manipulated. Let's say you’ve selected city as the dimension you’re interested in: do you want to include only data from a specific city, exclude data from a specific city, include only data from a specific list of cities, or display data from cities that contain a specific word? Operators let you take the basic city data and do much more with it than simply showing it. The OR operator is defined using a comma (,). It takes precedence over the AND operator, but cannot be used to combine dimensions and metrics in the same expression. The final part of a filter statement to be aware of is the string or value. Set at the end, the string or value should match those available for the dimension or metric you’ve defined in the first part of the statement, i.e if your dimension is city you must choose the name of a city to filter or else you will trigger an error. ga:source==twitter.com Traffic source is Twitter. ga:keyword==geckoboard Referring keyword is ‘geckoboard’. ga:pageTitle==Contact Title of page is ‘Contact’ (exact match). ga:pagePath=~contact URL of page contains ‘contact’ anywhere. ga:country==United Kingdom Visitor country is United Kingdom. ga:country==United Kingdom;ga:city!=London Country is United Kingdom and City is not London. ga:eventCategory==Reports,ga:eventCategory==Studies Show all events with the category Reports or Studies. ga:eventCategory==Reports;ga:eventLabel!=Share Show all events with the category Reports but exclude those with event label Share. ga:operatingSystem==Macintosh Firefox users on (Windows OR Macintosh) operating systems. ga:browser==Firefox,ga:browser==Chrome Operating system is (Windows OR Macintosh) AND browser is (Firefox OR Chrome). Google Analytics' Query Explorer  is a useful tool that, amongst other things, lets you test filters.